This weekend’s ice storm has done a lot of damage to trees in Southern Ontario. We’ve been lucky as the damage to trees on our property is minor. There is a broken limb on our maple tree, still hanging from the tree. Fortunately, it’s not in danger of damaging anything. We will have it taken care of by a certified arborist who is properly insured (WSIB and liability insurance), once the major cleanup is finished. I am concerned about our birch tree. None of the branches are broken, but they are bent in half and the tree canopy is sweeping the ground. The best course of action is to wait during this ice melting process. 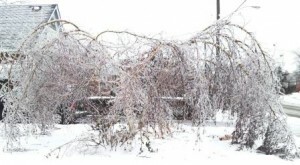 Knocking the ice off branches can cause damage to the vascular system of the tree and break fragile limbs. Another course of action is to spray the branches with cold water so the ice starts to melt. Never use hot water for this as it can scald the tree. Do this slowly so that the branches gradually take their original shape. If the ice is removed too quickly, branches can snap back causing damage. I don’t want to risk unnecessarily damaging our birch, so we will wait for mother nature to take care of it. Call the Landcare experts today at 416-410-0320 or contact us to request a consultation.